Our range of high-quality beading wire is beeing continuosly expaned and currently includes aluminum wire in various colors, thickness and surface structures and coated iron wire of 0.3mm, also referred to as beads thread. Whether round wire, flat wire, with a particular surface texture or beautifully arranged color sets, here you are sure to find what you need. We offer quality crafting wires made from aluminium, iron and copper in various styles and brilliant colors. The wires are perfectly suited for crafting, e.g. jewelry making, beading, decoration or floral binding. With Creacraft crafting wires you can easily create beautiful jewelry or stylish decorations for your home. 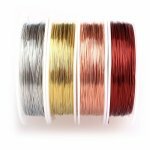 Beading Wire Set "Golden Autumn": 6 Colors of Artistic Anodized Aluminum Wire for Jewelry, Crafting - 12-gauge, 16 Feet Per Coil. 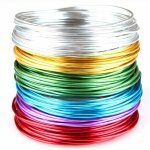 Beading Wire Set "Sweet Red": 6 Colors of Artistic Anodized Aluminum Wire for Jewelry, Crafting - 12-Gauge, 16 ft per Coil. 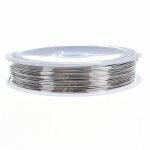 Beading Wire Set "Black-Styles" - 5 Coils of Artistic Aluminum Wire for Jewelry, Crafting - 12-gauge, 16.4 Feet Per Coil.